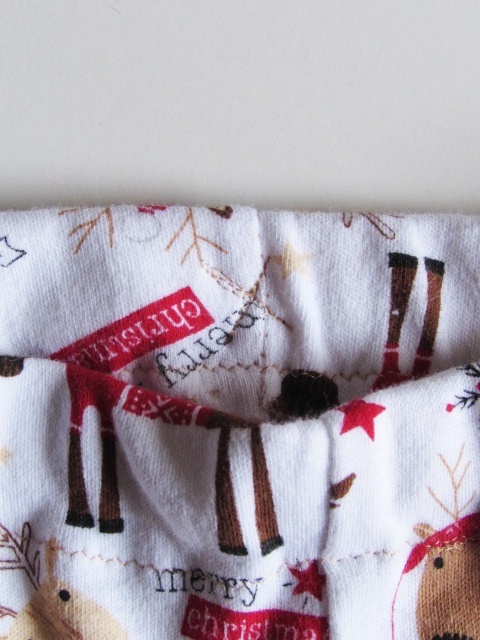 Last weekend I made the cutest leggings for my Vermont grand baby. This morning I took a few pictures to share with you. They will go off in the mail this afternoon so she can wear them for the holiday season. 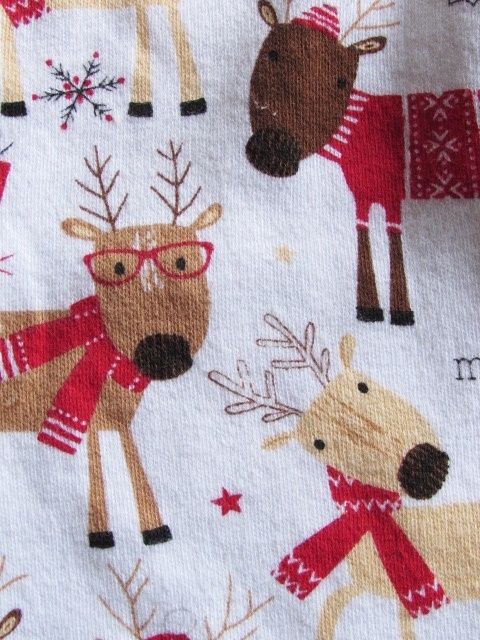 I was in Jo-Ann’s about a month ago and picked up this adorable reindeer fabric. I love the expressions on the face of these deer. At the time, I was hoping to make one-piece pajamas or a little dress with the fabric but I didn’t buy enough. Drat . I had enough for leggings though. As usual, I perused Pinterest and found this free pattern. It was just perfect, very simple and it went up to size 2T. My sweet grand daughter is a chunk and I didn’t want the pants to be too tight. The pattern is from Toddah.net and prints out on four pieces of 8 1/2 x 11 paper. 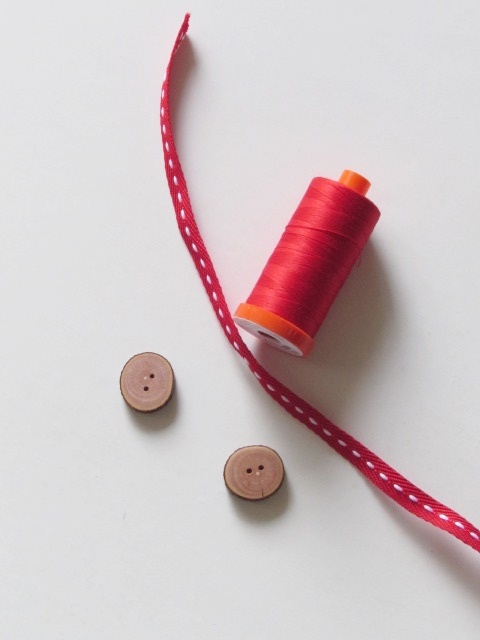 The instructions are simple and if you are just learning to sew, I recommend this project. It is beginner friendly. It took all of 45 minutes to cut and sew the legging. I used a tiny zig zag stich while sewing so there is some give with the knit fabric. 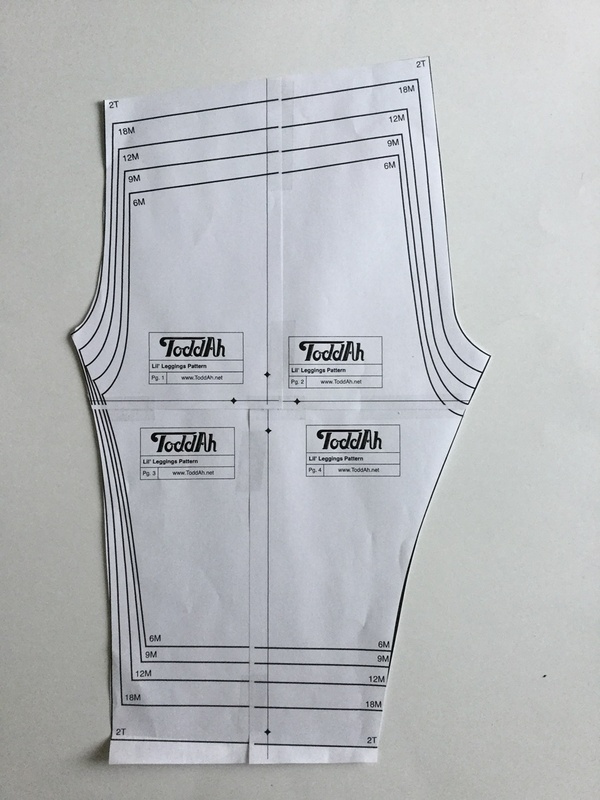 Each seam was finished with an extra zig zag stitch. I wasn’t exactly sure about the length. I had an inseam measurement of ten inches from her mama but it seemed long. I put elastic at the ankles. That way if they are long, they can bunch up at the ankles. Last finishing touch was to stitch an X at the back of the waist so it is easier to tell front from back. I can’t wait to see how these fit. 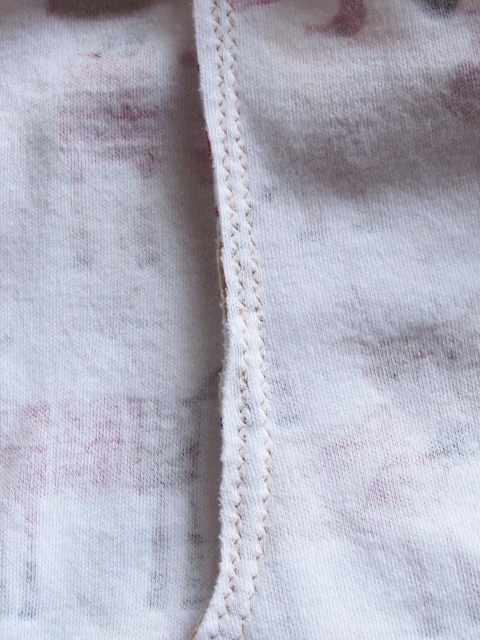 The twill tape would surely fray over the years so I stitched a teensy hem at each end and painted a bit of white glue over the ends. I think that will help the tape remain intact. What do you think? I feel like this is the icing on the cake. 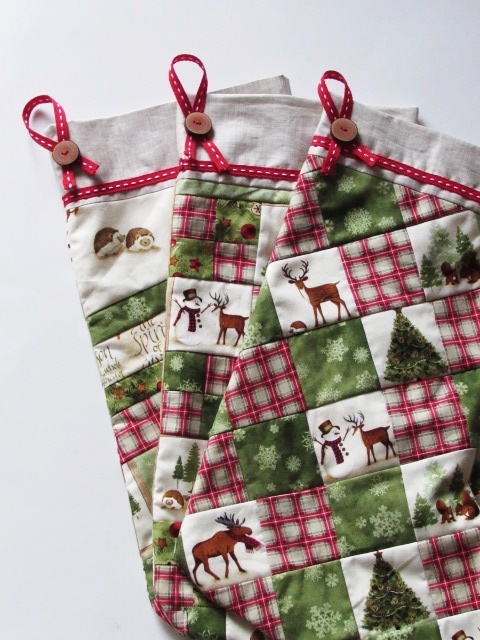 The stockings feel finished now. Do you want to see a button up close? Yes, I thought so. OK – This is it. No more blogging until after Thanksgiving Day. This afternoon Julia and I have a date to make pumpkin pie, fudge and the dough for tomorrow’s rolls. Happy holidays to you and your family! Linking up with my favorites. You’ll find the URL’s at the top of the page, under Link Ups. Finally, if you haven’t yet signed up for my newsletter, now is a good time. I have a fun Black Friday event planned. Sign up here. 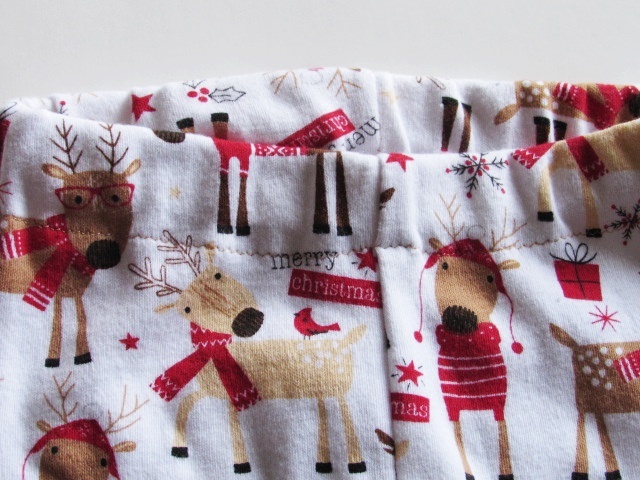 This entry was posted in Family, Garment Sewing, Sewing Clothing and tagged christmas stockings, handmade wooden buttons, infant leggings, leggings pattern, winter friends fabric on November 22, 2017 by Bernie. Lovely; the finishing details on the stockings really are perfect. Happy Thanksgiving! Thank you Yvonne! I love them – they just needed that last bit of decoration. Happy Thanksgiving to you and your family. OMG!! That’s all adorable!! And Hubby MADE the buttons?? Really? I’m very impressed. I was impressed too! Especially since I just asked him for buttons and this is his first attempt ever. They are so cute. I am not sure I would put them on a sweater – I don’t know how they would hold up to laundering. But as a decoration, perfect! Hi Judy — Thanks so much for the comment. He is definitely a handy guy. We have a lot of fun when we work on projects together. Let me know how the leggings go. I am sure you will enjoy making them. After that you will enjoy watching her wear them. 🙂 Happy Thanksgiving! Bernie, the leggings are adorable! And, you’re right. The twill with the buttons absolutely finishes the stockings. Great job on all of them! Thank you Nancy!! 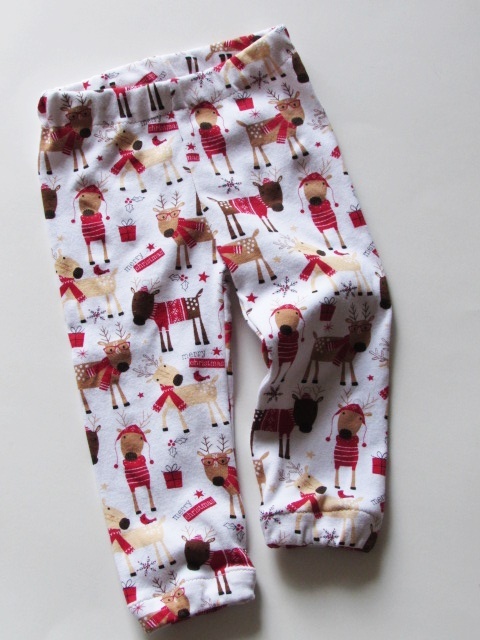 Those leggings will be a whole lot cuter when they are filled with chubby little legs. 🙂 Happy Thanksgiving to you and your family! Those buttons are the coolest! And those sweet, sweet leggings! I think my niece needs a pair… 🙂 Happy Thanksgiving Bernie! Thanks Beth. If those leggings fit (and I hope they do!) I will make more. 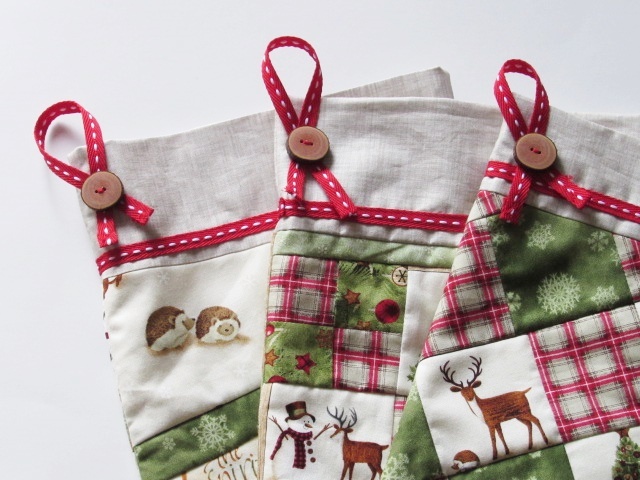 They are so simple – a fun, quick project. The leggings are adorable, and I love those buttons! So fun that your hubby made them! Happy Thanksgiving, Bernie! I’m hoping to pop by your site on Friday! Thank you Wendy. Have a wonderful Thanksgiving holiday. You are right the fabric is adorable and it makes great leggings, you are so talented. 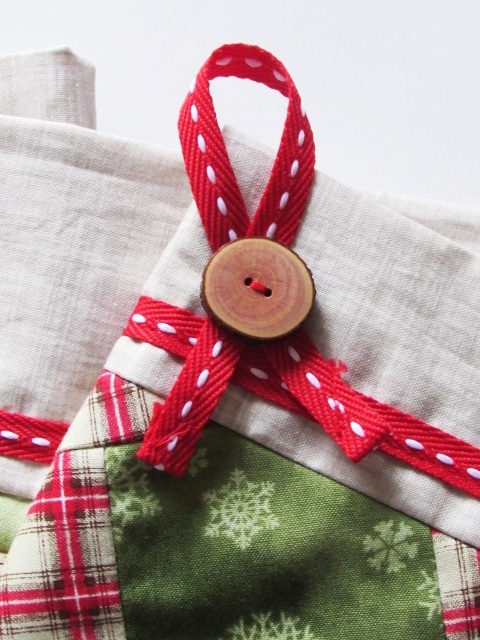 The twill ribbon is the perfect finish to your lovely stockings, you have a very talented husband, wonderful buttons. The leggings are adorable!! Sometimes there are some great finds at Joann’s! Add a little magic by Grandma and you have something wonderful! Even though you had other plans for this fabric, those leggings will be so much more flexible and useable.. Great job. Thanks Tammy. I sure hope they fit! Hard to see from such a distance for a little one. Hope all is well with you! Oh, sweet, cozy leggings! They will be such a fun addition to her holiday wardrobe. What a quick finish! I think you nailed it with the finishing touches on the stockings. I’m thinking there will need to be wooden buttons on some Chemex cozies, too.